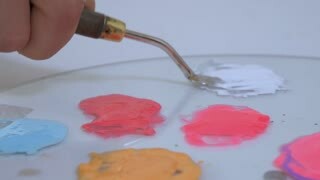 Paints being mixed to make right color. Billowy white clouds with gray undertones pass against a blue sky. Rosa Elle (Elle rose), a large hybrid tea rose with a color mix of shell pink with creamy undertones, and a citrus and spice scent.